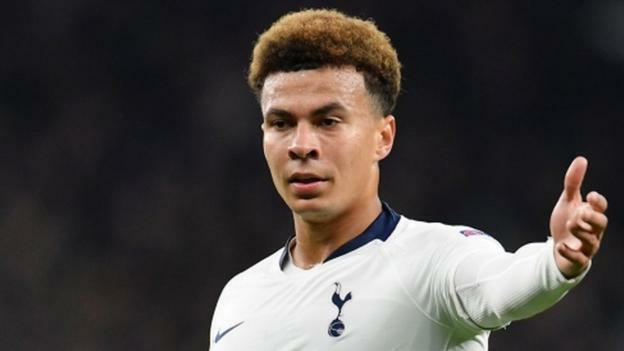 Midfielder Dele Alli has been named in Tottenham’s squad for their Champions League quarter-final second leg but will be assessed before Spurs decide if he will play against Manchester City. Alli broke his hand in last week’s first leg but has returned to training. City midfielder Fernandinho has trained after missing Sunday’s win over Crystal Palace with a muscle problem. Spurs forward Erik Lamela, who has not played since the last 16 second leg against Borussia Dortmund on 5 March because of a hamstring injury, has also trained and like Alli will be assessed after Tuesday’s training session. Tottenham take a 1-0 lead to the Etihad Stadium after Son Heung-min’s goal in the first leg last Tuesday. The first leg of Tottenham Hotspur vs Manchester City saw eight different English players in the two starting line-ups. The last Uefa Champions League game to see more Englishmen start was the 2008 Champions League final between Manchester United & Chelsea (10). Manchester City trail 1-0 after losing the first leg against Tottenham; of the 32 previous occasions of a side losing the first leg of a two-legged Champions League tie 1-0 away home, 10 went on to progress (31%). In European competition, Manchester City have lost all five of their previous matches against fellow English clubs, including all three in the Champions League. Manchester City have won 23 of their 25 home matches in all competitions this season (L2), although they have lost two of their last three home games in the Champions League knockout stages, winning the other 7-0 against Schalke in this season’s last 16. Manchester City’s Leroy Sane has been directly involved in seven goals in his last three home games in the Champions League (three goals, four assists), four more than he managed in his previous seven such games at the Etihad (one goal, two assists). Sergio Aguero scored 10 goals in his first seven appearances against Tottenham for Manchester City in all competitions but has since failed to score in each of his last seven games against them; missing a penalty in the first leg of this tie. Tottenham Hotspur from were eliminated the last time they won 1-0 in the first leg of a two-legged European tie at home, being knocked out by Kaiserslautern in the second round of the 1999-2000 Uefa Cup (2-1 on aggregate). Tottenham have won each of their last three Champions League matches; they have never won four in a row in the competition. Each of Tottenham’s last 10 goals scored in the Champions League have come in the second half of their matches; indeed, 93% of their goals in the competition this season have been netted in the second half (13/14). ‘Spurs slight favourites’ – who will progress? “This is the tightest tie of the four Champions League quarter-finals. “After their first leg 1-0 victory, Tottenham Hotspur are now marginal favourites with 52% chance of reaching the last four according to the Euro Club Index. Manchester City’s chance is therefore 48%. “City are still the most likely of the two teams to win the Champions League (12%) but Tottenham’s chance is up to 5%. “Whoever gets through is likely to have to eliminate two of Europe’s best five clubs to win the Champions League. “If Manchester City make it along with FC Barcelona, Juventus and Liverpool, every team remaining will have to knock out two of Europe’s best five teams to win the cup on 1 June.